We all make ethical judgments. We believe some things are wrong and others are right, and we can get very upset when we see unethical behaviour cause harm and distress. We have no doubt that Adolf Hitler was wrong in his “final solution” and in World War II, or that the behaviour of pedophiles, serial killers and rapists is utterly wrong. But what makes such things wrong? 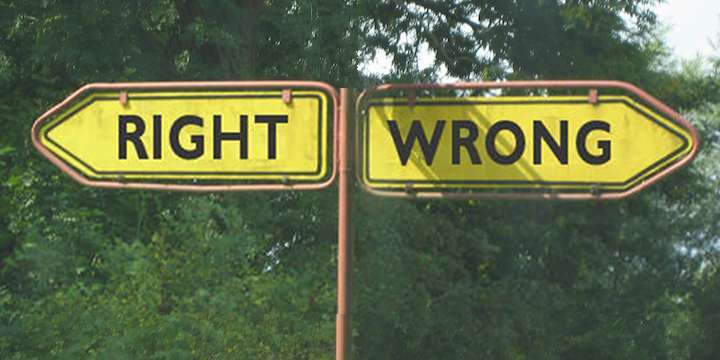 What do we mean by ‘right and wrong’? Ethics are more than just descriptions of behaviour, but are an agreed standard against which behaviour can be measured. The St James Ethics Centre in Sydney answers the question What is ethics? this way: “Ethics is about answering the question ‘What ought I to do?’ Whenever you are faced with this question, you are dealing with ethics” . Behaviour is about what is, ethics are about what ought to be. Evolutionary ethics – there is no objective basis for what we call ethics, as biologist Professor William Provine said: “Naturalistic evolution has clear consequences …. no ultimate foundation for ethics exists…”. Our behaviours are a result of evolution, so that what is successful is ‘good’. Cooperation and altruism will sometimes be the most successful, sometimes not. bad actions are those which we find emotionally repugnant. But while this view can explain why societies develop standards of behaviour, it seems in the end to be unsatisfactory, for three reasons. Evolutionary or relative ‘ethics’ are not ethics according to the St James Ethics Centre definition – they can only describe how things are, not how they ‘ought’ to be. This view doesn’t provide any reason why we should follow ethical behaviour if we think we will benefit and can get away with it. If ethics are relative, why shouldn’t I choose what suits me? In the long run, I don’t think we can live with such a view of ethics, nor do I think most of us actually believe it deep down. And, if more and more people accept this view of ethics, it seems likely that their motivation to behave ethically will be diminished if they see advantage to ‘break the rules’. The alternative view of ethics is that right and wrong are as fundamental to the truth of the universe as is gravity, except we have a choice whether we obey the ethics or not. There are two basic views here. This is the most common explanation, and it makes moral standards objective. But this still leaves questions: Which god and which set of ethics? Does God command things because they are right (in which case the standard exists independently of God), or are they right because he commands them (in which case they are arbitrary)? (This is known as Euthyphro’s Dilemma.) The common christian respone is that ethics are based on God’s character, but I don’t think this fully answers the question. Nevertheless, believing in God does appear to provide an objective basis for right and wrong, and this has been the view of most cultures throughout history. Theists argue that only the existence of a moral God provides ethics with the authority we instinctively give them. Atheists and theists both agree that prima facie this is a moral universe with objective moral values. Atheists who are moral realists attempt to show how this appearance is not deceptive and that such a universe is possible without God. But this seems to imply that the universe and truth are more than physical, and there is something metaphysical ‘out there’, something many unbelievers would be unwilling to say. It is also difficult to see how these objective ethics can be known, and known to be true. So the objective view of ethics also has its problems, but it does seem to correspond better with what we experience and innately know about right and wrong. It works better in practice, but raises some philosophical issues. Most people firmly believe in the truth and importance of ethics. I cannot believe that the clear certainty we have that some things are just wrong is compatible with a random, chaotic universe. I feel this is a most compelling argument against a purely materialistic view of life. Bertrand Russell’s dilemma is a dilemma for all of us! I see no problem in resolving Euthyphro’s Dilemma by believing that ethical standards are true like mathematics, and that God conforms to them just as he knows 1 + 1 = 2. The fact that most atheists believe in the same ethical standards as believers confirms this. But God is important for ethics because (a) he is the authority behind ethics so we know what is true, and (b) he provides an assurance that one day those who do evil will be called to account – two things that non-believers cannot be sure of. Although right and wrong vary so much over time, and from culture to culture, there is enough in common to argue that the problem is at our end – when we try to avoid difficult or unpalatable aspects of morality. The principles seem to be clear, but we work out the details differently. Those who believe that ethical statements are true and should be followed by everyone have to seriously consider whether this implies that God exists. Perhaps this is a point at which proponents and opponents of moral arguments for God’s existence might agree on. Moral considerations give all a reason to examine the proposition that there is a God very seriously. For if there is no God, morality is a more perilous enterprise than if there is. The moral argument takes these ideas and tries to demonstrate in a logical way that God exists. Photo: MorgueFile. Page last updated: 20 March 2016. Take an in-depth look at the philosophical argument based on our views about ethics, in The moral argument. If God exists, surely he wouldn’t allow so much suffering? Check it out, in How can God allow evil? What does it mean to be human, in Are our brains like computers? . Is religion a force for good or evil? Get some facts and some ideas in Does religion poison everything? Metaethics. Stanford Encyclopedia of Philosophy. Ethics. Internet Encyclopedia of Philosophy. The Evolution of Ethics. S E Bromberg. Theological Basis of Ethics. Larry Pettegrew. The Biological Basis of Ethics”. Peter Singer. The Philosophical Basis of Humanist Ethics. Victor A. Gunasekara. Moral Arguments for the Existence of God. Stanford Encyclopedia of Philosophy. Moral Arguments. Secular web – a listing of many papers, mostly by atheists. Dear Bertrand Russell , B Feinberg & R Kasrils (editors). George Allen & Unwin, 1969. Letters to and from philosopher Bertrand Russell. The Abolition of Man , C. S. Lewis. Demonstrates a wide range of ethical beliefs common to such diverse cultures as Ancient Egyptian, Old Norse, Ancient jewish, Babylonian, Hindu, Ancient Chinese, Roman, Native American, Ancient Greek and Christian. Lewis’s book ‘Mere Christianity’ includes an extended version of the discussion in this topic. Turning Point , Hugh Mackay. Pan MacMillan. A study by a social researcher into attitudes of Australians.